Subject: Icons, Icons, Everywhere ? 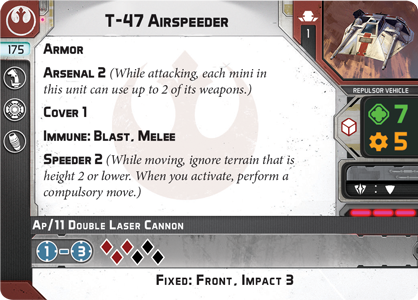 I have a question about one the AT-RT and Airspeeder cards, where troops have a courage icon these have a cog like icon, does anyone know how this is used? Also have we had any reveal on the names given for the upgrade icons yet? Apologies if this has been asked before, I had a quick search and couldn't find anything. 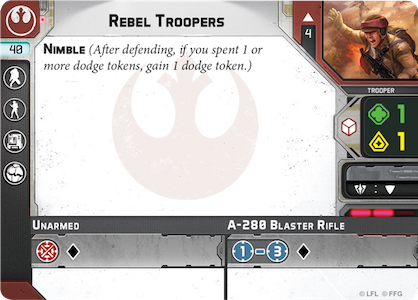 I cant say exactly but its liek that Troops get Supression Tokens that affect their morale and Vehicles get some kind of damage, that for example they cannot move, or one weapon is disabled. The cog icon on the vehicles is called "Resilience" and represents how much damage the vehicle can take while still functioning at peak efficiency. When the cumulative wounds taken by a vehicle equal it's Resilience it gets a minor negative effect for the rest of the game, either Damaged (I think it only gets one action per turn instead of two), Disabled (movement reduction or restriction), or Weapon Destroyed (loses one of its weapons). There's a die roll to determine which. We know the names of most of the Upgrade Icons. The vehicles have some additional Upgrade Icons. 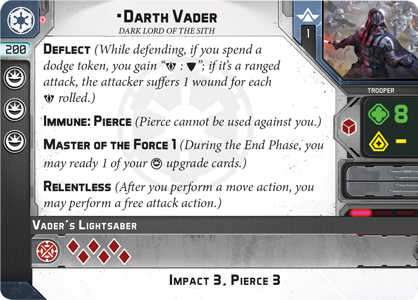 When Veers and Leia come out, they share one additional Upgrade Icon that I'm guessing might be called "Leadership" but there's no guarantees on that.